The first week of Survivor Pool action was incredibly easy and straightforward if you didn't outsmart yourself. Pittsburgh was the clear, obvious and only choice playing against Cleveland, and they took care of business. People who picked the Bills against the Jets did fine, too. As did those who went with the Falcons over the Bears. There were, however, two groups of people who are now on the sidelines licking their wounds, and frankly both deserve it. Houston should have won at home against the Jaguars, but after all the turmoil they had gone through post-Harvey, and given that they were relying on Tom Savage at QB, trusting them in the face of so many better options was irresponsible. And then there are the six percent of people who picked the Patriots. Sure, New England should have been better at home. But they were facing a team that had won 12 games last year, had had a decent offseason, and was far from incompetent. New England should have won, but if you argue that that was the best pick on the board then you fundamentally don't understand Survivor Pools. Let me make this simple - if you pick against a team that won 10 or more games the prior year then you are an idiot. Stick by that rule and you're fine. Oakland vs. New York Jets: Oakland looked very good beating a good Tennessee squad handily at home. The Jets weren't much of a match for a Buffalo team that is pretty bad. 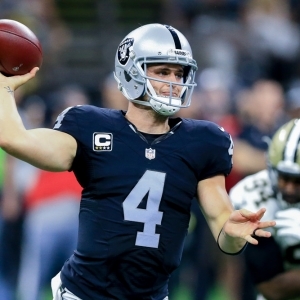 Oakland has Derek Carr at the helm of a potent offense. The Jets don't have a quarterback who is deserving of being a fourth stringer on a real team - and there is no such thing as a fourth stringer. This is a mismatch in every single way, and that doesn't even take into consideration that the Jets have to make the tough cross-country trip. This is so clear and obvious a pick that if I have to explain it more than you are never going to get it. Just make the pick. Arizona at Indianapolis: The Colts are just embarrassing. Humiliating. Terrible. Andrew Luck couldn't save this trainwreck of a team, but in his absence there just isn't any hope here. If they beat any teams this year it will be a total and utter fluke. Picking against them is going to be a frequent and comfortable Survivor Pool strategy this year. The only reason that this game isn't as attractive as the Raiders' game is that I don't trust the Cardinals as much. They have let their competitive window narrow significantly the last two years, and they showed in their opener against Detroit that they aren't a top-level team. And now they are going to be without David Johnson, which makes their offense much less dangerous. The Colts aren't going to surprise anyone, but I don't trust the Cardinals to stay out of their own way all the time. This is a fine enough pick, but it just pales in comparison to the other one available. In many circumstances this would be a dream pick, but in this case it's like picking a souped up Mazda Miata when the other choice is a Lotus Esprit. Miata's are nice and all, but there is no defending that choice. Tampa Bay vs. Chicago: Normally this would be a nice pick, but there is too much going on to make it work. For one, as I write at least we don't know where it will be played, or how long the Bucs will be out of Tampa this week. We also have a very fresh reminder from the Houston game this week that it can be tough for even a very good team to focus on a game and come in fully prepared when their cities and their lives are in turmoil. I like the Bucs a lot, and another chance to play them should come along at some point, but picking them here is just forcing something you don't need to force. JUST PICK FREAKING OAKLAND.